Make yourself to home in these beautiful and comfortable condominiums in a great location on Sanibel. Your condominium will be within a mile of the Sanibel Causeway, Periwinkle Avenue, and the Light House. From your condominium you will be able to quickly access shopping, great restaurants, and many attractions on the island, on Captiva, or on the mainland. This easy access is especially important if you visit during the peak season or if you have children and young adults who want it all. Just relax, this condominium which many describe as 'FEELS LIKE HOME' is a perfect getaway location for that perfect vacation. With great gulf views and located on the second floor of a two-story building at the gulf-front SANIBEL ARMS WEST complex, your fully-air conditioned, NON-SMOKING condominium has two bedrooms, and easily SLEEPS SIX when using the sleeper sofa. BEACHFRONT UNITS ARE ALSO AVAILABLE. These well built and quiet condominiums are an ideal setting for you to relax, kick back, and enjoy the heaven we call 'Sanibel.' We take pride in maintaining a #1 RATING in the condominium rating system. Whether you want to fish the Gulf of Mexico, swim the refreshingly warm waters of the Gulf, search for manatees, sail a boat, hunt for the perfect SHELLS, bike on the 25 miles of BIKE TRAILS, take a KAYAKING trip, go sightseeing, witness the rich WILDLIFE at Ding Darling or throughout the area. The master bedroom contains a king-size bed (NEW as of April 2012), adjacent screened-in lanai, 2 night stands, telephone, and color flat screen TV with remote. Beautifully furnished as you can see in the photos. The guest bedroom has two twin beds (NEW as of April 2012). Large dresser and night stand. Flat screen TV. The large living room has seating for six, a sleeper sofa, **NEW** 55' FLAT SCREEN TV, VCR/DVD Player, and stereo system. The dining room opens into the large lanai (screened-in porch) through a huge sliding door. All-electric kitchen is fully equipped with range, oven, microwave, refrigerator, and dishwasher. 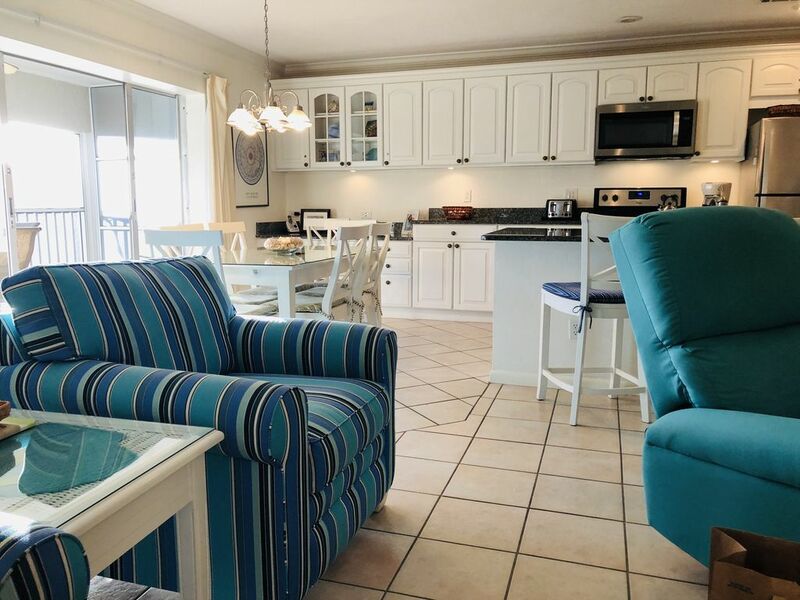 This Sanibel Island unit contains all dishes, utensils, cookware, bath towels (guests must bring own beach towels), and linens. Other amenities include screened-in heated pool, sundeck, tennis courts, canal boat docks, and miles of natural, white beach. Top this off with the fact that you have also just discovered one of the best values on VRBO® on Sanibel. In comparing properties, consider cost, quality, and closeness to the beach. When you have done that, this condominium is perhaps the best deal on Sanibel. I am a software engineer by training, but am a director level manager at a small company, but that's boring. Theresa is an elementary school teacher. I was born in Northern NY near the Canadian border and live near Syracuse, NY now. I am married with 2 adult children. My hobbies include golf and music (singing and handbell ringing). Sanibel, in general, and Sanibel Arms West, in particular, are beautiful and relaxing areas to vacation. It has been a good investment. the wildlife preserve (Ding Darling) is amazing. Biking, beaching, walking, and eating are my favorite things to do while on the island. Excellent location! Clean and relaxing! Loved the screened in porch! Perfect for our young family of four. The toddler could go to bed early, the school age kid could watch a movie and my husband and I enjoyed the screened in porch! We are so happy that you enjoyed our piece of paradise. Yes, the lanai is wonderful for relaxing meals, reading a book, or enjoying the warm summer breezes. The cleaning staff does a wonderful job at creating a spotless condo for our guests. I hope you come back again soon. Thank you for all of your kind words. Our family of 5 had a really lovely time here on Sanibel Island. H7 was a very nice unit that suited us well. It is very clean, nicely updated, and only a short walk to the beach. The beach itself is full of live critters and shells, and the island is also home to a wonderful nature preserve. Great location and very close to the beach. Couldn’t have been more satisfied with our stay! I can not thank you enough for all of your very kind words. The cleaning staff at Sanibel Arms West does a wonderful job at providing a spotless clean condo for our guests. We also have standards to maintain when stocking our unit; so your comments really hit home. There are many wonderful, family friendly restaurants on the island, especially the ones that you mentioned - most are not all that far from the condo. Pinocchio's has the best ice cream! Sunsets (and sunrises) are top notch on the island as well. The sunset dolphin cruise sounds wonderful and I will have to try it next time. I have taken the shelling cruise from "Adventures in Paradise" and it is great too. Again I am so excited that your family had such a great vacation. Thank you, thank you. Thank you very much for all of your kind words. Your willingness to recommend our condo is the ultimate compliment. Within the last 9 months we got brand new beautiful living room furniture and all stainless appliances. Thanks again for staying at our bit of paradise. We loved our stay! Our 3 year old loved it so much and was so upset when we had to leave! Very close walking distance to the beach and close drive to restaurants and shops! We loved sitting in the screened in patio during random rainstorms and the whole place was very comfortable and decorated beautiful! Would definitely stay here again! Thank you very much for your great comments. Obviously, we would agree. We work hard to keep it up to date. Back in November we replaced all the living room furniture with comfortable, beautiful and high quality furniture. In April of this year we replaced all the kitchen appliances with stainless steel appliances. Again I say thank you. It was fantastic! Our unit was beautiful! Couldn’t have asked for more. Will definitely come bac. One of the best units we have ever stayed at! Thank you so much for this wonderful review. We are constantly making improvements. We just recently installed stainless steel appliances. That turned out great. We really appreciate all of your feedback. Rates are Subject to Change. For 7-night minimum requirements, a Saturday to Saturday stay is required. Deposit Requirements: January and Peak Weeks: A deposit of $500.00 per week is required All other weeks: A deposit of $300.00 per week is required Cancellation Policy: Reservations cancelled 60 days prior to arrival will receive a refund less a $75.00 service fee.